I just bought a new plant and was wondering if I should transplant this spring or wait. It seems to be happy with new shoots but the pot looks small. How can you tell if it is root bound? Thank you for helping. Ponytail Palm need to be in a tighter container. 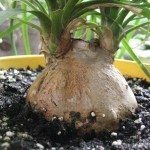 This article will help you with your new plant.